De Picobello Shell is a different way of camping. The Shell is a timber built, insulated hut designed to be used just like a tent but unlike a tent it is already set up on the site, ready for you to move in! The Picobello Shell has plenty of headroom and a floor area of 3.0 meters by 4.5 meters – ample space for 4 people. 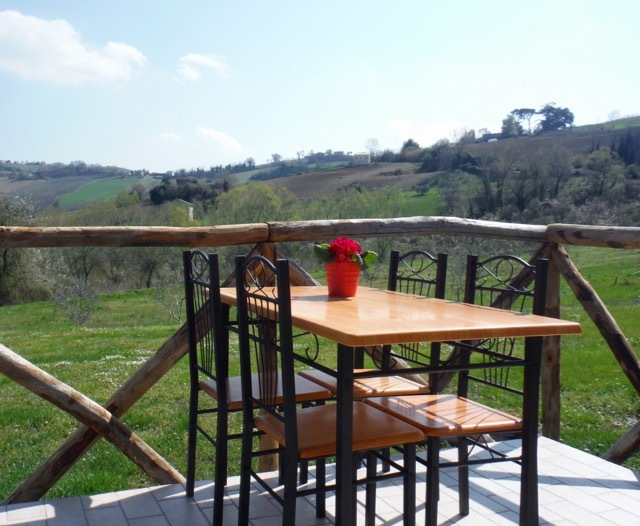 Call it glamping in Italy, Le Marche! The Shell is a simple progression from the holiday under canvas; they offer a convenient alternative to the tent but retain all the ambiance of the ‘camping holiday’. Those staying in the Shell can take advantage of all the other site facilities. 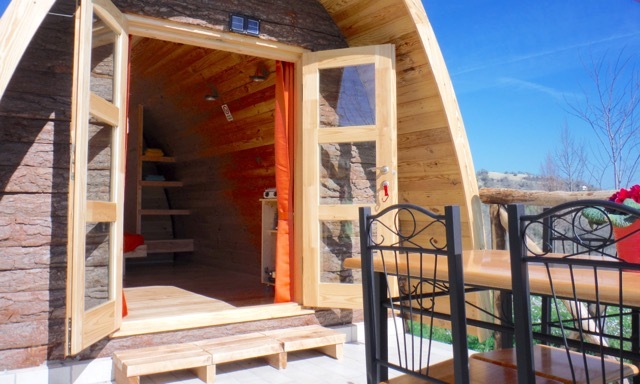 This can be your pod holiday in Italy! The lighting is controlled via LED lights that are powered by solar energy and the structure is made from durable Nordic softwood and finished with a water based stain. You’re sleeping in real beds, there is a fully equipped kitchen and the Shell offers you your own private terrace. Linen and towels are supplied. You’ll find the toilet and the shower in our nearby shower block. Get a better impression of the Picobello Shell: scroll down and click on the video below! Price based on 2 persons and a minimum stay of 3 nights. 1 person extra € 7,50 per day. Maximum numer of people in the Shell = 4. We do recommend to book well in advance so that you will be sure to enjoy your vacation in Le Marche Italy with us. After having received your data we will send you a provisional reservation with the request to make an initial payment. You find our bank relation and necessary data in the provisional reservation. For all our accommodations a minimum stay of three nights is applicable. As soon as we have received your initial payment we’ll send you a confirmation. For all accommodaties applies a booking period of minimal 3 nights. The rest of the payment concerning a tent-place has to be paid at the moment of your departure. The other 50% initial payment for our rental tent, B & B, Picobello Shell and gypsy caravan has to be paid at least 14 days before your arrival. Please fill in the required fields below to make your reservation.